Ian May's advert for indicator lenses. Yes they are, the same as the mini and MGF Rover etc. I have listed the first of a few items I aim to sell on eBay, some of which are harder to find items. In case anybody is interested there's a brake upgrade kit on eBay. Possibly a Vauxhall V6 caliper upgrade with Subaru disks. Well somebody got them ?! Hope you guys don't mind me posting. 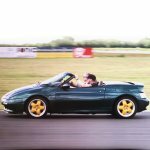 I had to sell my Elan last year. Keen to move on the S2 wheels I purchased at great expense to help fund another Elan! Last edited by 62dave on Wed 09.08.2017, 10:35, edited 1 time in total. Was about to post your wheels on here also but you beat me to it . The only one thing i would comment on is that you say they are not in the best finish and then show a picture of them wet ... I would rather see them dry so i can judge the actual finish rather than water masking the actual condition .. May well be worth uploading some dry pictures ..
All the best with your sale . simonbuk wrote: Well somebody got them ?! Yeah, me! Arrived today ... by the way, good guess about what it was ..
Calipers are GM FN3-57/25 (used on GM 2.0l Vectra & Calibra, Saab and other mid-range saloons from 95 on), unused but have a bit of surface rust and in Nastra packaging so may have been refurbed. Pads are Power Stop 100326, never heard of them but Googling tells me both Nastra & Power Stop are US companies and list Rock Auto as distributors, so I think I probably know where they've come from. The discs are plain 295mm Subaru 5 stud, as on my Subaru Forester, with 4x100 stud holes drilled, same size as on my 'daily use '93 SE' HiSpec conversion. The 15mm thick aluminium spacers to give the correct caliper offset came in a Jiffy bag addressed to a "Bob Brown" at an address in Saffron Walden ... Seems likely it was part of a Group Buy which somebody bought but never got round to fitting. about showing them dry ... I just thought they looked dented ! Cheers for the advice chaps.. will take some better pics! Well these wheels went for good money - I was hoping to pick them up for under 200 quid !! simonbuk wrote: Well these wheels went for good money - I was hoping to pick them up for under 200 quid !! Blimey... and I've got a stack of them in my lockup .. Think I'll remove them from my eBay search then !! $500 speedo cluster, $1000 headlamp pods, $500 right side mirror assy! The guys name would have put me off buying. Dr Piss Taker WTF ??? donsladek wrote: Sky high prices! with stupid pricing like that it would put me off even making an offer ..
Rambo wrote: The guys name would have put me off buying. Dr Piss Taker WTF ??? I never even noticed that !! Shame as he is about 5 miles away from me !! They have had the car for over a year and their prices are still crazy. I tried to work on a few parts before they posted on eBay but they are convinced they will get those prices so not willing to adjust anything. Ironically, it had a set of my shift cables on it but they took them apart and didn't keep everything. I have some pictures of the car in their yard and there are parts laying around it on the ground that are suddenly valuable if you ask about them. Shame. They could have helped a few cars become whole again. It would be worth offering up prices at a third of theirs and offer shipping to the US !! Maybe but the price of 16x7 wheels compare well to silly prices asked for S2 wheels in the UK. Strange that 3 are $175 but 4th will cost $199 and they all look the same - 'if you want the set I'll squeeze a few more dollars out of you"